Welcome to DiscountedStamps.co.uk. The UK’s Number One online retailer of discounted postage stamps. Whether you’re looking to save money on sending 100 letters or run a business and want to send 20,000 parcels, DiscountedStamps.co.uk is the perfect place to save money on postage! If you have a large quantity of stamps for sale why not contact us for a quote. 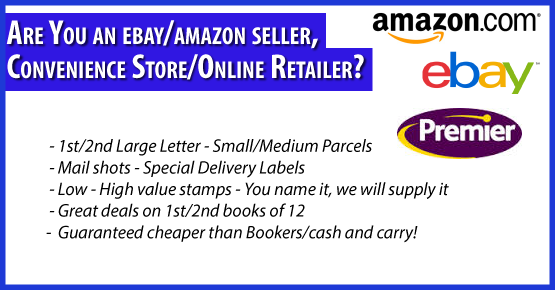 We are always sourcing stamps and can offer top prices on sheets and books. Immediate payment by bank transfer or cash can be arranged. Very trusted and immediate payment so can assure hassle free selling! 100 – 1000 x 2nd Class Themed Editions *up to 4% Discount* 58.56p each! Have Royal Mail Postage Stamps To Sell? We are always sourcing postage stamps so Contact Us today if you have quantities of stamps you want to sell.